You know you ski a lot (or just wax a lot) when your scraper becomes dull. The folks at Swix ski a lot and decided it was time that somebody made a sharpener for wax scrapers. 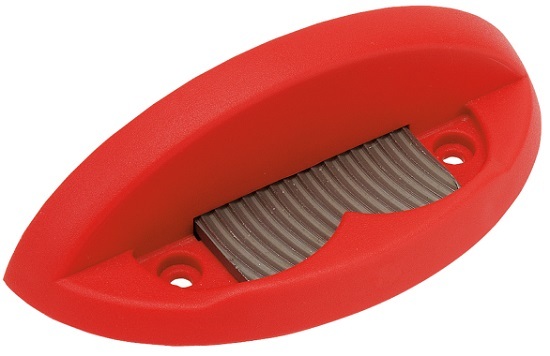 If your wax scraper has rounded edges, the Swix Plexisharpener is the perfect tool to revive it. Slide any acrylic scraper over the file and it becomes square, meaning less passes to scrape off your hot wax. Renew your tools today. I've had one of these screwed down onto my wooden workbench since our house was built in 2006. The orientation should be like that shown in my picture, with the vertical guide closest to you. The only drawback to this design is that the scraper might develop somewhat of a concavity over time, as the tendency is to sharpen more of the middle of the scraper edge's length. Another approach is to use a sander on your scraper edge, but that of course entails placing your scraper in a vise then getting out your sander (assuming you already have a sander). For a quick refresh though of the scraper edge, this Swix tool is perfect. And for anyone wondering whether scraper sharpening is the ultimate in gear obsession, not really: the time spent refreshing a scraper edge is far less than the extra time spent scraping off wax with a dull scraper. Whoops, picture not loading -- but just take the listing picture and reverse it by 180 degrees for correct orientation screwed down on your work bench. Sometimes gets gummed up, but overall an excellent tool to keep screwed to the workbench. A sharp scraper makes waxing a pleasure rather than a pain, and this is a simple and cost-effective way to make em sharp. What is 8 + 11?